"Dr. Candelora did an outstanding job on both of my hips. Recovery was great." "Made me feel at ease and comfortable with my recovery. " "Excellent staff thorough explanations, even with an expidated appointment." "I recently had my hip replacement. I could not be happier!! My life has been given back." "I felt like the staff has compassion and cares. Enjoyed my visit it's was pleasant." "Thank you for making my shoulder as good as new." "Top shelf - Very compassionate and knowledgeable. Excellent staff." Dr Candelora is the best! He is personable & answered questions I didn't even know I had! "Great experience, would refer him to all friends, etc." "...Dr Candelora is your Doctor for Orthopedics... best of the best!!!" Dr. Peter Candelora serves the New Port Richey, Florida, community as the founder of Coastal Orthopaedics & Sports Medicine. He specializes in joint arthroplasty including minimally invasive procedures for both hip and knee replacements. He and his staff strive to stay at the forefront of orthopaedic technology to offer their patients the most current surgical innovations. He started his medical career in his home state of Pennsylvania with concurrent Bachelor of Science and Master of Science degrees in Biology at Bucknell University. After graduation he was accepted to the prestigious Tulane University in New Orleans, Louisiana to study medicine. Once completing medical school, Dr. Candelora remained at Tulane for his residency in orthopaedic surgery. He then moved west for specialty training at the University of California, Los Angeles (UCLA) affiliated Rancho Los Amigos Hospital in Los Angeles. He then returned to the South for additional education in sports medicine at Hughston Sports Medicine Clinic in Columbus, Georgia. Dr. Candelora is board certified by the American Board of Orthopaedic Surgery, a member of the Florida Orthopedic Association, the Florida Medical Society, the Pasco Medical Society, the Hughston Society, and Tulane’s Caldwell Society. Check out what patients are saying about us across the web! "Doctor is always understanding, listens to what you are saying and works with you to provide you the best care." "The staff is very nice and the office is bright, spacious and clean. Highly recommend Dr. Candelora!" "I am so happy with the great service I received for my knee. Dr. Candelora will be highly recommended by me." 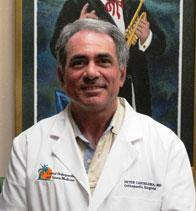 "Dr. Candelora makes me feel comfortable and he truly cares about my needs. I appreciate that he spends one on one time with me to answer questions and concerns of mine." "I only have good things to say about Dr. Candlora. he was very kind to me when no one could tell me what was wrong with my hip." "Dr. Candelora took the time to try and help and I believe he found the source. Three weeks later, I was almost pain free!"